Posted byadmin	 30. 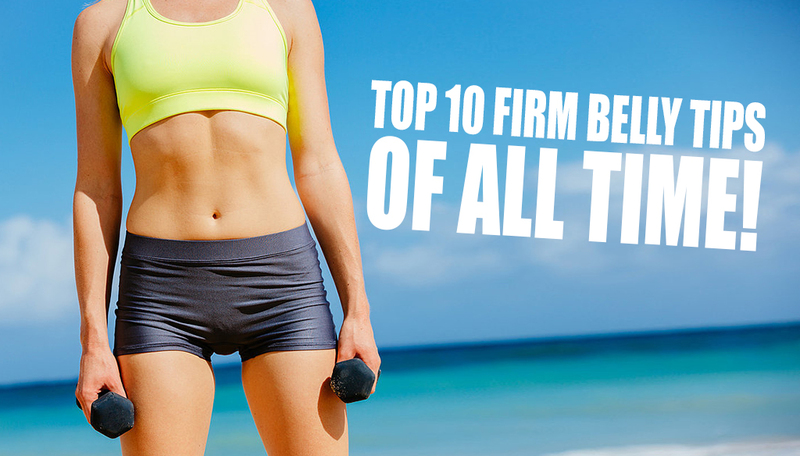 July 2015 Leave a comment on Top 10 Firm Belly Tips of All Time! It’s all one sheath of muscle: the rectus abdominus. “If you feel the upper abs working, it doesn’t mean the lower abs aren’t engaged,” says Alycea Ungaro, owner of Real Pilates in New York City and author of The Pilates Promise. Where you feel it depends on the move’s anchor point. For example, leg lifts engage more of the lower section since your upper body is against the floor. To truly tone, try a mix of ab-sculpting moves that vary positions. To target your abs more effectively, strengthen your pelvic-floor muscles. “These muscles assist your deepest abs in doing exercises correctly,” says Olson. Actively engage them by gently pulling your belly button toward your back. Place one hand on your abdomen; if you feel your stomach pushing out while you do sit-ups, you’re pushing the pelvis down rather than pulling muscles up and in, cheating your abs of the full workout. Keep muscles contracted when working abs. Strong pelvic-floor muscles also help tone your abs post-pregnancy (it helped me after my son was born). I can do 50 crunches without my abs aching, but if my neck starts killing me after 10, I’m done. I often pretend I have an orange tucked under my chin to release the tension. Or I press my fingertips into the base of my neck and give myself a nice neck massage while curling up. Another strategy: To stop neck muscles from tensing, place your tongue firmly on the roof of your mouth as you crunch. Related article: Squatting Barefoot: Is It Better? One thing I’ve learned for sure: All the exercises in the world mean nothing if there’s a layer of fat over my abs. So I do about 45 minutes of calorie-blasting cardio, three to five times a week. “You need to burn body fat through regular aerobic exercise to see strong abs,” says Olson. I can tell I’ve worked my abs well when they’re sore the next day. Like other muscles, the abs respond best to intense training every two days. Work them too hard, too often, and you’ll see minimal progress, says Holland. My no-fail stability-ball exercise targets the deep (transverse) and “six-pack” (rectus abdominus) abs as well as the obliques. Begin in a full push-up position, with shins pressing into the ball. Pull knees into chest, then roll back to start; repeat for 1 minute. Pull both knees up to right elbow, back to center and to left elbow. Continue for 1 minute. Pilates is one of the best methods for all-around toning. My favorite move is the modified Corkscrew, which zeroes in on the abs, obliques, thighs, and hips. Lie back with arms at sides and straight legs perpendicular to floor, with either a Pilates Flex Circle or a stability ball (anything that adds resistance will work) between your ankles. Without lifting your hips, bring both legs to the right, turning your head to the left. Take a breath, then return to start; switch sides. Do 3 sets of 6 to 8 reps, squeezing the ring with your thighs.